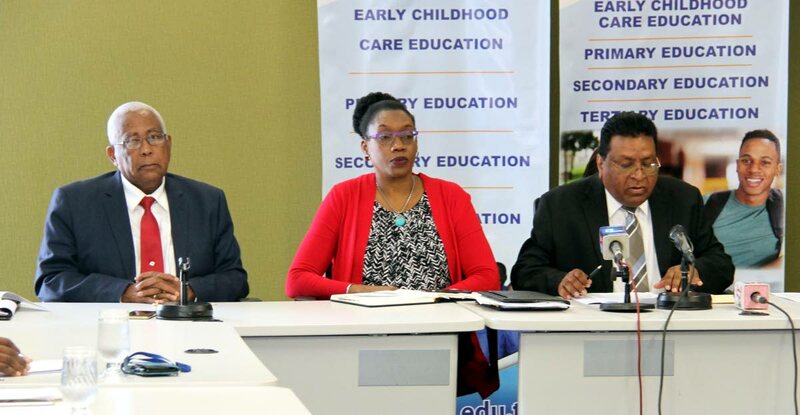 SCHOOL TALK: Education Minister Anthony Garcia, permanent secretary Lenore Baptiste-Simmons and Chief Education Officer Harrilal Seecharan at a news conference yesterday. THE 11 year-old Guyanese-born student who was being denied permission to sit the May 3 Secondary Entrance Examination (SEA) will be allowed to take it after all. He was originally told he would not be able to take the exam because he was a non-national. The acting permanent secretary of the Ministry of Education yesterday wrote to the lawyers representing the child’s guardians who, this week, threatened legal action against the ministry. Education Minister Anthony Garcia was sent a pre-action protocol letter warning that if the boy was not put back into his Standard 5 class and allowed to sit the exam, a court injunction would be sought. The boy and his two siblings were born in Guyana but had been under the care of their Trinidadian parents in this country for the past ten years. The letter, issued by attorneys Jagdeo Singh, Keil Tacklalsingh and Denish Rambally, said the child had been a fifth-standard pupil until just “a couple weeks ago” at a school in Carapichaima when the school’s staff, purportedly acting on the direction of some type of “newly implemented policy” from the ministry, removed him and put him in standard four. It said school staff told his guardians that because the boy was not a TT national he would not be allowed to do the exam. The child and his guardians had already selected four schools, had he been successful at the SEA exams. In its response, the ministry’s acting permanent secretary said all students whose registration for the 2018 examination remained pending because they do not have a student permit will be allowed to sit the exam. The ministry, however, said a student’s admission to secondary school was contingent on the production of a student permit, in accordance with Immigration regulations. A source at the ministry said it has always been the policy for a non-national student to obtain a permit to register at a school in TT, and the ministry was simply enforcing the regulations under the Immigration Act. In their letter to the ministry, the lawyers said the child’s siblings had been allowed to sit the exam in 2010 and 2017 at the same primary school and to continue to the secondary level. It went on to say that the ministry owed a duty of care in relation to meeting the child’s educational needs. “Recently when the Honourable Prime Minister advised the nation to open doors for Dominicans to have a home and education, we dare to say that he did so paying particular heed to your duties and the ministry’s. “If there is in fact a purported policy now being implemented by the Ministry of Education, that a non-national student (such) as the child in question cannot continue with his education, such a policy clearly does not serve any valid educational purpose and is in breach of the statutory authority/mandate provided for under the Education Act. Simply put, such a policy is without educational purpose and serve, not to promote, but to prevent education,” the letter said. Reply to "Guyanese child allowed to sit SEA exam"